Tehran and Lisbon could cooperate not only in issues of mutual interest but can act as a bridge between Europe and the Middle East, said the Portuguese foreign minister. President Hassan Rouhani said Iran and Portugal could build a bridge between the Middle East and Europe. In a meeting with Portugal’s Foreign Minister Rui Machete, he pointed to the long-standing ties between the two countries and said that ranking officials from both countries have been exchanging visits during the past year. The president said the visit of the Portuguese foreign minister is a staging area for the two countries to start more active cooperation in the international arena. The Iranian president stressed that the world should focus on settling such major problems like violence and terrorism which are afflicting not only the Middle East, but the whole world, including Europe. Referring to Iran’s nuclear talks with P5+1, the president said the Iranian nation is determined to safeguard its nuclear technology it has developed for peaceful purposes. He said the remaining differences between parties involved in nuclear talks are neither legal nor technical but political and require firm determination to be settled. President Rouhani went on to say that Iran’s nuclear activities have been under the constant supervision of the International Atomic Energy Agency within the framework of international regulations. 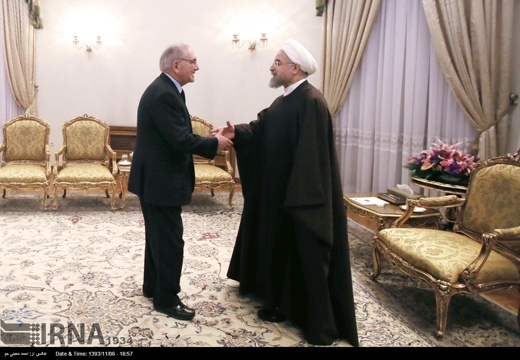 He stressed the peaceful nature of Iran’s nuclear activities and underscored that pressures on Iran are quite baseless. He said pressures and sanctions would harm all parties engaged in the talks. He said Iran is determined to speedily settle the nuclear case to focus on the development of the country. The Portuguese foreign minister voiced interest in expanding relations with Iran and said time is ripe for both countries to transform their ties. He said he believed Tehran and Lisbon could cooperate not only in issues of mutual interest but act as a bridge between Europe and the Middle East. As for Iran’s nuclear negotiations, he said his country was well aware of the positive consequences of any agreement between the negotiating parties.